Divination by observing thunder, lightning, weather, meteors, shooting stars, etc. 1. Divination by examining the lines, etc. of the face or forehead. 2. Divination and character analysis by interpreting facial lines and wrinkles; especially, of the forehead. Derived from ancient Greek <>metopon, "the forehaead"; originally the space between the eyes. Divination with the smallest thing available. Divination by observing the motion of molten lead on a flat surface or in water and the interpretations made of the hissing sounds. 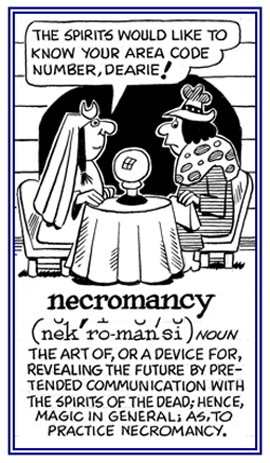 Divination by interpreting imbecility or through nonsense; divination of the foolishness of someone. Divination by the movements of mice. Divination with opium and its effects or with drug-induced sleep. 1. The practice of attempting to communicate with the spirits of the dead in order to predict or influence the future: As entertainment for the evening gathering, Ms. Hester-Jones hired a person to demonstrate necromancy so she could supposedly raise spirits and communicate with them. 2. 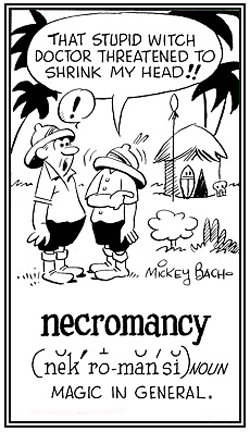 Witchcraft or sorcery in general: During some periods of history, to be accused of necromancy resulted in some accused practitioners being executed. Divination by communication with the dead by raising them back to “life” (not as ghosts); early Greeks were supposed to descend into Hades to consult the dead rather than summoning the dead into the mortal sphere again; more recently, it is claimed that ghosts or spirits are summoned to speak to the living. A study of clouds and their various formations, as a means of divining future events. Divination by looking at the kidneys of a sacrificed victim. Divination from names or the letters of a name, as, the number of vowels in a name, the sum of the numerical value of the letters, or the like. Divination by communication with the dead. Divination by interpreting the eyes of certain human subjects. It is said to be similar to hypnotism in a primitive form. Showing page 10 out of 16 pages of 227 main-word entries or main-word-entry groups.